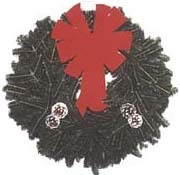 FBW 1 Fresh Balsam Wreath 22 - 24"
Flowing evergreens laced with a red velvet bow and charming Christmas piks. This graceful arch is a welcoming sight over any entry way, window, fireplace, or garage door! 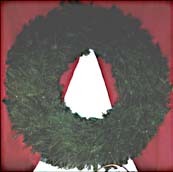 EFW 2 Elegant Fraser Fir Wreath 22 - 24"
Especially aromatic, our fraser fir has a short thick needle with a silver back. This Appalachian native holds its color and needles longer than any of the evergreens. Luxury crowned by a red velvet bow and 4 frosted cones! Ideal for a variety of indoor and outdoor uses! 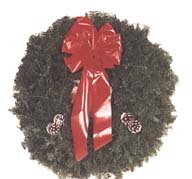 HH 5 Herald in the Holidays 20"
Fragrant fraser greens hug a bright brass horn. 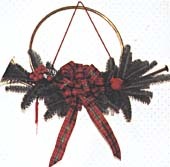 Our plaid puffy bow, red feathered bird, and shiny red berries, let you blow your own horn at that next holiday get together. CC 4 Candy Cane 24"
"Visions of sugarplums danced through their heads," while these delightful candy canes dance through your holidays! A wistful eye-catcher, sporting a bright red plastic bow!